Readers from last year may recall the story of WBro. 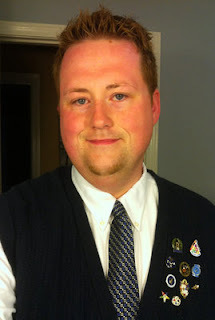 John D. Wright of Kentucky, who announced to his lodge that he was openly gay and attempted to get anti-discrimmination legislation passed at Grand Lodge in 2010. Wright went on to blog about his situation and kept the gay issue at the forefront of his posts. At one point charges were filed against him by members of his lodge, who privately told me that homosexuality was not the only reason for the charges, without elaborating at that time. He was subsequently suspended. Well, it seems that Wright was just arrested for stealing $10,000 from his lodge between 2009 and 2011. John D. Wright, 27, of Radcliff, was arrested Saturday morning by the Kentucky State Police, according to the Hardin County Detention Center’s website. An arrest warrant for Wright had been issued after a Madison grand jury indicted him last month on a felony charge of theft by failure to make required disposition of property. Wright is being held without bond and will be transported to Madison County Detention Center. Court records show the case has been assigned to Madison Circuit Court Judge Jean C. Logue. The charge against Wright was a direct submission to the grand jury, meaning the case had not proceeded through Madison District Court first. Most criminal cases begin with arrest and proceed in district court. Felony cases typically are referred by the judge to the grand jury. If a person is indicted on one felony charge or more by the grand jury, the case will continue in circuit court. Commonwealth’s Attorney David Smith said the KSP and Richmond Masonic Lodge 25 had requested the case be directly submitted to the grand jury. KSP Detective Monte Owens testified at the closed hearing about the “lengthy investigation” conducted by the agency into Wright’s handling of the lodge’s funds from July 2009 to April 2011, according to KSP Post 7 Public Affairs Officer Paul Blanton. Blanton said an investigative audit was conducted of the lodge’s records. In 2010, Wright told a Winchester Masonic lodge, at which he was the Master, that he was gay, according to a Lexington Herald-Leader story. He had been with the organization since 2007. Wright told the newspaper that lodge members asked for his resignation, which he refused to give. Later that year, a proposed change to the Masonic state constitution to bar openly homosexual members was voted down at the group’s state gathering. However, organizational charges were brought against Wright for going public with private Masonic information and forsaking God by declaring his homosexuality. A Masonic trial found Wright guilty of “un-Masonic conduct” on April 8, and he was indefinitely suspended, according to the Lexington newspaper. A former Madison County man accused of stealing thousands from a Richmond Masonic Lodge entered an Alford plea in circuit court, and the state is recommending a five-year sentence. John D. Wright, 28, entered the plea last week to a charge of theft by failure to make required disposition of property, according to Commonwealth’s Attorney David Smith. An Alford plea means the defendant does not admit guilt but acknowledges that enough evidence exists for a conviction. The prosecution recommended Wright receive a sentence of five years in prison. His plea deal also requires that he pay $13,000 in restitution to the lodge, Smith said. The crime was investigated by the Kentucky State Police.The sentence recommendation is the minimum for the Class C felony, which carries a sentencing range of five to 10 years in prison. His sentencing in Madison Circuit Court is scheduled for 2 p.m. May 9.Wright caused waves in the Kentucky Masonic community in 2010 when he told members of his Clark County lodge that he was gay after he divorced his wife, according to a Lexington Herald-Leader article. He joined the organization in 2007. A Frankfort lodge proposed a change to the group’s state constitution that would prohibit openly gay men from being Masons, but the proposal was rejected by vote during a 2010 Masonic statewide gathering, according to the article. However, a 2011 Masonic trial on mutliple counts found Wright guilty of “un-Masonic conduct,” and he was indefinitely suspended, the newspaper reported. Wright ran for District 4 constable in Madison County during the 2010 election. He came in third-place for the Democratic primary. I note with interest that this Brother was in the East 3 years after being raised. That in itself is a big problem waiting to happen to a Lodge. This is really depressing as I know many gay brethren that truly hope his strange actions dont reflect on their own devotion to the craft. It should be known that in other jurisdictions (I can speak for PA, MA & NY, based on brethren I've met), the issue he raised initially has never been an issue. The argument being that when it was a federal or state offense, one would be barred from membership, but since that's no longer the case, personal moral ideals, such as his own, cannot be argued against masonically since some faiths, like my own, Episcopalian, do not consider it demoralizing. This guy's a bit of a wreck and I really hope his legacy doesn't tarnish that of the non-straight, regular, brothers that I know/have met. This is quite sad. It's important that Lodges impose fiscal controls that make embezzlement difficult. Any accountant or auditor can advise on such controls (such as two or more signatures required to pay out funds) and scrutiny of suppliers to the Lodge (to ensure that funds aren't being paid to shadow companies controlled by the embezzler). I have been in the Chair for two years, and was raised in 2006, so was elected Master 5 years after being raised. I think that 3 years may be too soon, but each Brother ought to be judged on his individual merits. The selection and interview process is the first Gate, and care at that stage can help to avoid problems later. Goliath Lodge #5595 UGLE, but speaking only for himself and not for the Lodge. @Peter Arnold, depends on the Brother. I was installed in the East 33 months after I was raised. Brother Hodapp was installed in the East 21 months after he was raised. Don't tar us all with the same brush, please. He may very well be guilty of using lodge funds as his own. It is a matter that needs to go through the full process. However, from a gut point of view, and the fact that a grand jury was convened without going through the usual process makes me feel this smells in some way. I am not a Kentucky Mason, but if he got to the east, even moreso that quickly, how much "discrimination" is there in the Lodge? Clearly not much. Being NOT a Kentucky Mason nor acquainted in any way with this fellow I can tell you this: His sexual preferences are of no concern to me. However, this theft charge is most disturbing and time will tell the tale. Let us pray that Justice is done. So, how did the trial go - any news there? No trial, Wright plead guilty. Been in jail since May, 2013.